Earlier this week, I mentioned my first quilt and how it came about. I noted that Doris Kruger, a former home economics teacher from Peotone, IL in the far south suburbs of Chicago, greatly inspired me. Sadly, I learned that she died on Monday. She was 90 years old. I hadn't heard from Doris in some years; she moved to an assisted living complex in another town. I moved to another state. I lost track of her, but she was never far from my thoughts. With each quilt I've made I have thought about her. I know that with every quilt I will make in the future, I will think of her as well. In the mid-90's, I was the reporter/editor of the town's local newspaper. I called upon Doris for information often. She was a reporter's dream. Not only did she have her hand on the pulse of the community, but she was willing to share accurate information, and was never afraid to give her opinion. I loved that about her. Doris belonged to numerous quilt guilds and organizations. She started an quilt show at the First Presbyterian Church. Always the teacher, she wanted the shows to be a learning experience rather than just an entertainment venue. She insisted there be a speaker and often times a hands-on demonstration. I recall one woman who collected and sewed men's silk neckties. Another introduced needlework and cross stitch. Doris insisted that each quilt tell its own story. She compiled the information into a little booklet with each meticulously numbered item, its creator, and date when the quilt was completed, as well as a paragraph about it. When admission tickets were taken, each patron was provided a booklet and disposable plastic glove with instructions not to touch the fabric with bare hands. A fine, tasty luncheon always accompanied the show, served by church volunteers. Food was served on tablecloths, in china, using flatware. There were never paper plates. Not only did I cover the annual quilt shows, but once Doris insisted that I bring a family heirloom quilt my husband's grandmother had stitched many years ago. That may have been the beginning for me, as the shows started to become more personal. I remember the first time I saw a small quilt that was done with stippling overall. I had never seen anything like it before. I just loved it. I was bitten by the quilting bug. Once I told Doris I was interested in making a quilt, she was supportive. When it was finished she insisted that I enter it into a show. 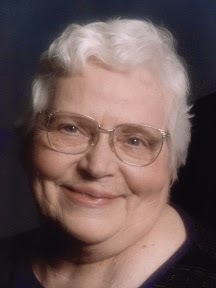 While I loved the quilting shows, probably one of Doris' greatest legacies was as co-founder of Helping Hands, an organization that began in the 1980's when Doris recognized that not everyone thrived in her small, upper middle-class community. She was moved by students who started school in tattered clothes and hand-me-downs. So she and a group of caring women sewed new clothes for more than a dozen families. They hand delivered them three times per year--at the start of school, at Christmas and at Easter. Doris told me about one little boy who was so pleased with a new shirt he had received that he put it on right over the one he was wearing. She and the other ladies delivered bags of donated food every other month to the same families, whose names were never revealed publicly. She was quick to recognize that the real gift is in the giving rather than the receiving. Helping Hands has since grown into a food pantry that provides for the needy and seniors in the area. The program has grown into a food pantry that last year, according to the local paper, collected 60 tons of food. I had often fantasized about having had a teacher like Doris when I was in high school. I imagine her being strict, demanding, but always inspiring, the kind of teacher that you would always remember. I know I will never forget her.